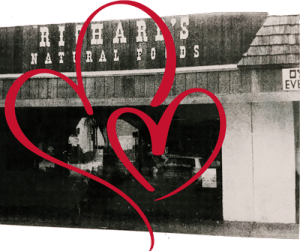 Richard’s Foodporium® first opened its doors in 1979 as an independently-owned natural foods store in southwest Florida and, after 40 years, our customers still love us. Our overriding mission is to offer natural and specialty products at affordable prices, and to provide exceptional customer care. There are now multiple stores in operation with an expanded selection of products, including a number of private label items. The Richard’s Foodporium® brand is backed by a wealth of experience and dedication. We are always striving to better meet our customers’ needs and enhance their shopping experience. At Richard’s we help our neighbor’s transition to a healthier lifestyle, without being overwhelmed by choices or feeling guilty over small indulgences. We work cooperatively with multiple philanthropic, professional and local businesses to support our communities as well as environmental needs. Richard’s has won dozens of awards including Best Natural Food / Health Food Stores, Best Place to Shop for Natural Foods, Favorite Health Food Store, People’s Choice and Business of the Year in multiple Florida communities and Best Independent Chain Retailer in the Nation. At Richard’s, we appreciate your business and want you to be completely satisfied. If for any reason a product does not meet your needs, you can return it for a full refund (unopened and with a receipt) or a store credit (opened and/or without receipt). Special orders are welcome; however, we do not accept returns on non-stock items outside of manufacturer defect. Don’t see the product that you’re looking for? We’ll be happy to do our best to meet your needs. If we can get it for you from any of our vast array of vendors, we will be happy to help you. Just click here (link to Special Orders page) or call for more details (Some order/return restrictions or minimum quantities may apply). Please be aware that special and non-stock orders are not eligible for refunds outside of manufacturer defect.